Initially inspired by atoms trapped in optical lattices of light, wherein the atoms play the role of electrons and the light plays the role of a solid state lattice, other atom-laser systems based on designer optical traps have emerged as leaders in atomtronics. For example, as described in today's issue of Nature, JQI physicists, led by Gretchen Campbell, have demonstrated a tool that is critical to electronics: hysteresis. This is the first time that hysteresis has been observed in an ultracold atomic gas. 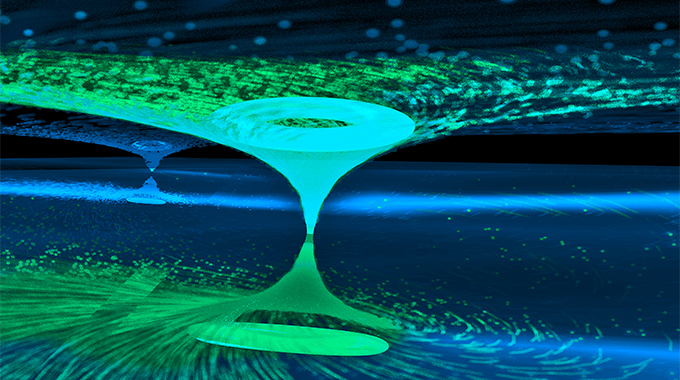 The cover of this issue features an artistic impression of the superfluid ring system. Other recent JQI atomtronic work includes atomic analogs of both a transistor and an RF SQuID (Superconducting Quantum Interference Device). SQuIDs work because of a fundamental property of superconductors: When exposed to an applied magnetic field, a ring of superconductor generates currents which produce magnetic flux exactly canceling the external field. When the current reaches a critical value (determined by a junction or weak link in the ring), it “jumps” by a discrete amount, allowing a quantized amount of flux to penetrate the ring. Measuring the effect of that action on the current across a junction allows one to measure the strength of the applied field, and SQUIDs are routinely employed to detect very weak fields such as those produced by brain waves or nerve impulses in muscle tissue. Read about how an atomtronic SQuID can be used as a rotation sensor.